Most sped. teachers already have a draft schedule that they are relatively happy with. But you can always make your schedule better, and let's be honest, you'll probably change it twenty more times before winter break ;-) So, when you're reviewing or editing your schedule, think about these tips to try to make your schedule a little better. -Make sure you built in "non-negotiables"
This might seem like common sense, but when reviewing your schedule, you need to make sure you put in "non-negotiables" or things you absolutely don't have control over. These things include: lunch, g-tube feeds, toileting, medication administration, specials, etc. My first year of teaching I actually left bathroom off the schedule somehow! I knew I had toileting skills to work on with many of my kiddos but I was just a newb and somehow looked over putting it on my schedule. oops! Be flexible with things in the schedule that you can be flexible with. For example, if you have to schedule lunch/ breaks for 3 paraprofessionals, give them the option (if you can) of having a 30 minute lunch and a 15 minute break or just a 45 minute lunch. (This completely depends on the district/state you live in and the rules or laws on lunches/ breaks.) At the beginning of each year, I give my paras the choice between a break and lunch or a longer lunch. Then, I am able to figure out when in the day I can schedule breaks/ lunches. Next is where I get flexible... 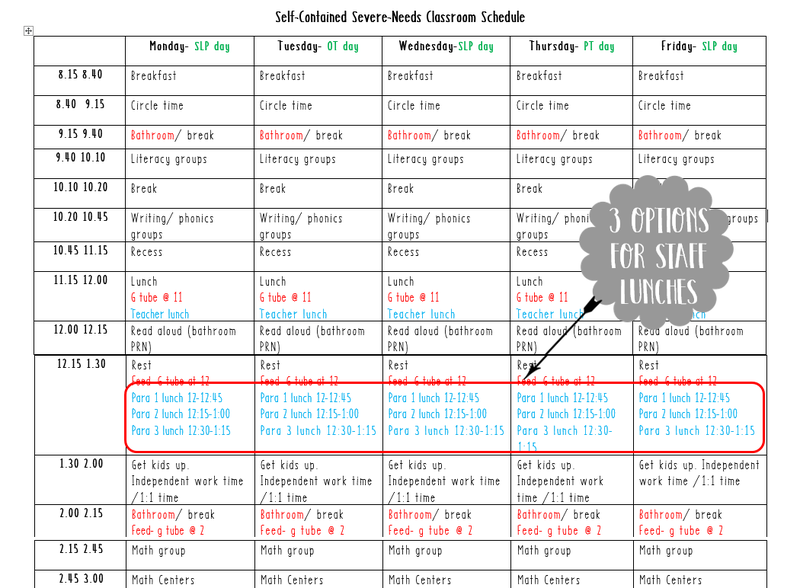 I let paras decide a few things that really don't impact the classroom much at all: They decide if they want to have the same lunch time for the entire school year or if they want to rotate lunch times between the paras each week. 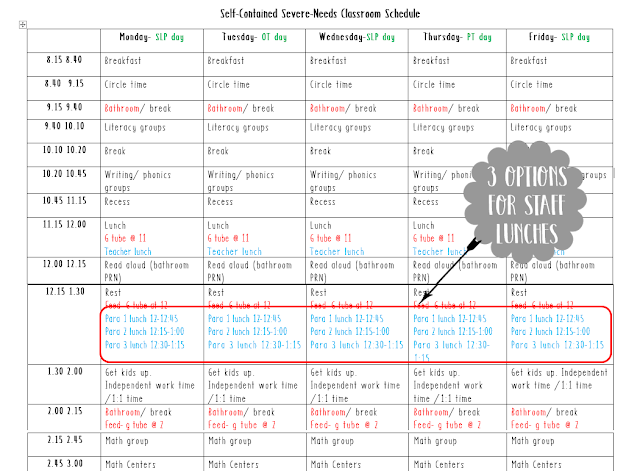 After it's decided if they're doing a rotating lunch or the same time for the whole year, then paras identify what lunch time they want or make a rotation schedule. I have found this to be so helpful because my paras have really appreciated having a say in a part of the schedule that really impacts them. -Take care of yourself too! No matter what, make sure that you have a scheduled lunch time! It's sad but true that it's "normal" for sped teachers to not have a lunch time... And I don't mean "don't have a lunch" because you're planning/ prepping for the afternoon, making phone calls to parents or touching base with the school psych.... I mean the not having a lunch because you don't make time in the schedule because you're doing g-tubes, changing diapers, or in the lunch room with kids to make sure a runner isn't getting out of the building... That was me my first few years of teaching... aaaaand I'm still working on it, but last year I scheduled a lunch for me and it was the best thing I could've done for myself! It was hard to stick to it, and I probably only actually took my lunch 50% of the time, but I promise you, that I was a better teacher on the days I actually took my lunch. I will definitely try sticking to it more this year. At the beginning of every year, make a chart like this that shows all the service time for your kiddos. Once you have a visual of all of your kiddos' service times, then you can easily see where in your draft schedule service providers can work with your kiddos. This will help you to see what slots of time you'll have to make in your schedule for therapists. What things do you think are important when making a schedule? 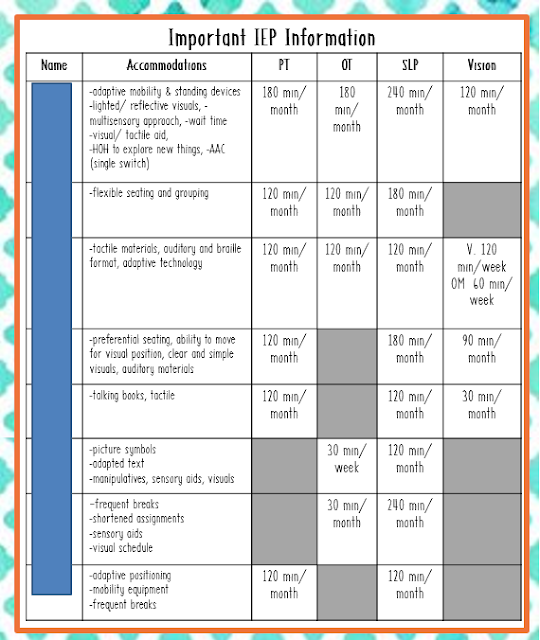 I love the look of your schedule and students' needs sheet! Great post! Thank you for sharing your ideas, I'm re-looking at my schedule now.